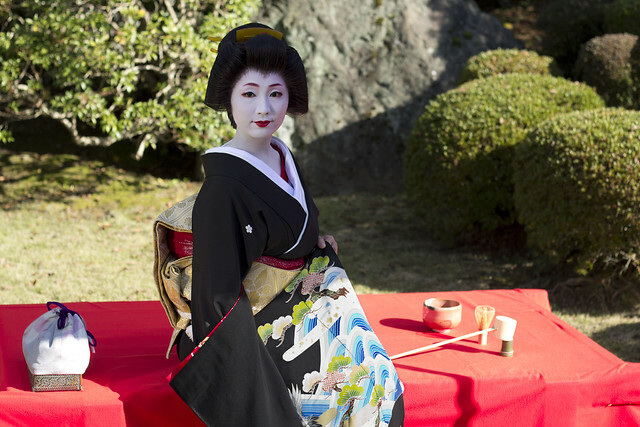 There are five areas in Kyoto, that you can see a Geisha in daily lives. Those Geisha districts are called “Hanamachi” or “Kagai” in Japanese. Around this Geisha district, there are lots of places related, such as tea houses and Okiya; a place where the Geisha stay. 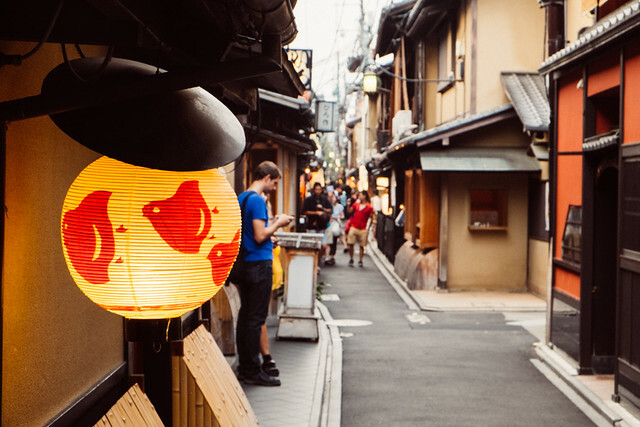 Even just visiting a Geisha district is full of atmosphere, and an experience that you can take home as a souvenir. In this article, I would like to introduce the difference between the five Geisha districts. There are currently five active Geisha districts in Kyoto. “Gokagai” means five Geisha district in Japanese. The five Geisha districts are, Kamishichiken, Gion Kobu, Ponto-Cho, Miyagawa-Cho, and Gion Higashi. The names of the Geisha districts are the names of the area. In each area, there is a Kaburenjo which means a place to practice the traditional culture; such as Japanese dancing and tea ceremonies. 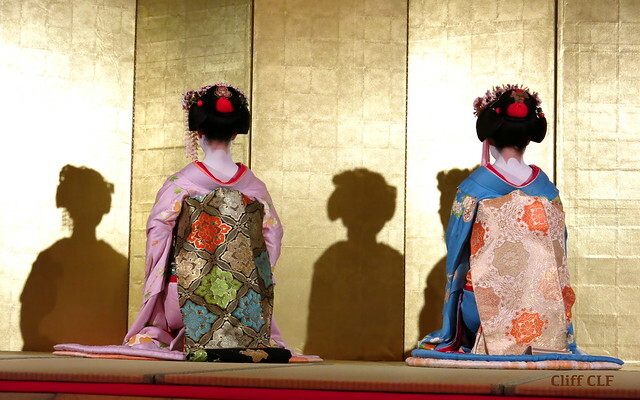 The history of Kamishichiken is the longest than the other four Geisha districts. It is located in the northwest area of Kyoto city, and just east of Kitano Tenmangu Shrine. Kamishichiken is the least famous Geisha district than the other four Hanamachi. It is said because of the other four areas is near downtown, but Kamishichiken is a little far from downtown. Kamishichiken began as a tea stall and prospered at the area near Kitano Tenmangu Shrine. It is located in the northwest area of Kyoto city, and just east of from the shrine. 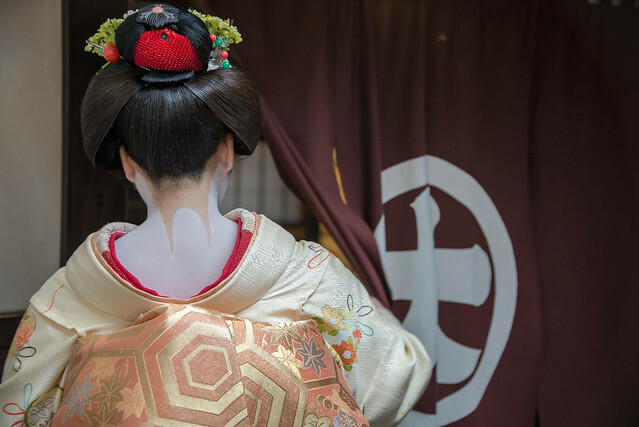 Kamishichiken is deeply ingrained in the culture of one Geisha district. The meaning of Kamishichiken in Japanese is, “Seven Upper Houses”. This refers to the seven teahouses built from the equipment and material left over when rebuilding Kitano Tenmangu Shrine in the old days. The seven tea houses were first made for the visitors to take a rest. Kamishichiken is also located near the center of the city’s weaving and textile industry, Nishijin. Therefore, around Kamishichiken you can find shops that sell Nishijin textile. Maybe buying a souvenir at the shopping area is nice. The motif of the district crest is a dango; Japanese traditional sweets that are served at tea houses (the second photograph). Gion Kobu and Gion Higashi use the same dango as a motif, but the number of the dango are different. Kamishichiken uses five dango that are connected in two rows. At Kamishichiken, the Geisha follow the Hanayagi-ryu style of Kyo-mai dancing. 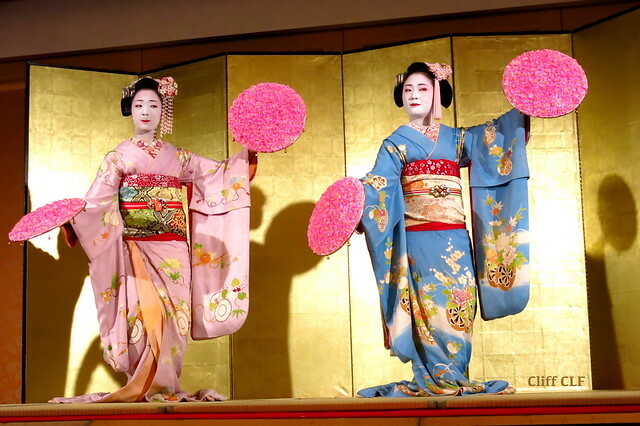 Kitano Odori (March 25th – April 7th) and Kotobuki Kai (October 8 – 12) are the shows popular at Kamishichiken. Another difference is the Maiko beer garden that is held in summer. Getting served and having a conversation with a Maiko is a very rare experience to have. If you are interested in Maiko beer garden, check more details at Ms.Kuriyama’s article, “Maiko Beer Garden Experience in Kamishichiken, Kyoto”. Gion Kobu is the most famous and biggest Geisha district in Kyoto. 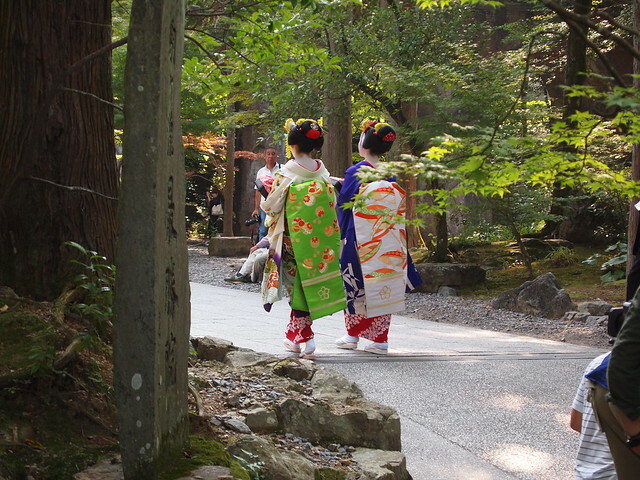 The numbers of the Geisha are the most largest from the other four Geisha district. It is a chance to might find out the type of girl you like by the numbers of the Geisha. Gion Kobu was originally one Hanamachi called Gion. It divided into two Hanamachi many years ago to Gion Kobu and Gion Higashi. Gion Kobu is larger than Gion Higashi, and is occupying most of the district except the northeast corner of Gion. It is located south side of Shijo street, and north side of Hanamikoji street. 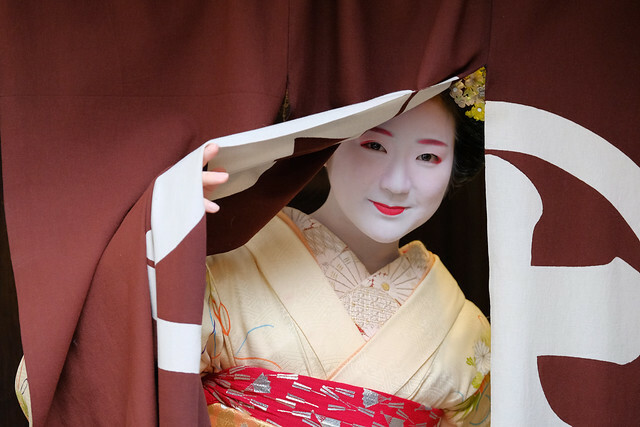 The number of the Geisha are declining in the last one hundred years even in Gion Kobu, but is still a popular and famous place for the preservation of forms for entertainment and traditional architecture. Even now, people can enjoy the traditional architecture and the distinctive atmosphere that is protected by Kyoto City and the people in Gion. Gion Kobu and Gion Higashi started as a tea stall in front of Yasaka shrine. After the days as a tea stall, it became a famous official licensed Geisha district in Kyoto. Until 1881, Gion Kobu and Gion Higashi was the same Geisha district. The motif of the district crest is a dango same as Kamishichiken. However the connection and the numbers of the dango are different. At Gion Kobu, eight dangos are connected in a row. Gion Kobu is also been declared as an area of natural history preservation. Which means to protect the appearance of the town, and to look the houses and buildings in the area the same as they have been when Kyoto was the capital a long time ago. Gion Kobu covers the South side of Shijo street and north side of Hanamikoji street. Gion Kobu follows Inoue style of Kyo-mai dancing. It is also famous for Miyako Odori (April 1 – April 30) that is held when the cherry blossoms are blooming, and the Onshu Kai (October 1 – 6). At Gion Kobu Kaburenjo Theater, there is a famous place called Gion Corner. It is a place where people can enjoy six different Japanese traditional culture including Geisha performance. Having an experience of six different Japanese traditional culture at once from ¥3,150- is a rare experience to have. If you are interested in Gion Corner, please check the details from, “Gion Corner -Stage Of Maiko Performance-“. Ponto-cho is another famous Geisha district in Kyoto. It is well known for traditional teahouses and Kaburenjo; where they practice their skills. Not only that, Ponto-cho is famous for the beautiful preservation of forms of traditional architecture and a place full of atmospheric dining areas. Ponto-cho is one road through Sanjo and Shijo street. It is only 500 meters long, and one block west of the Kamo-gawa river. In the north side of Ponto-cho, there is the Ponto-cho Kaburenjo Theater. Ponto-cho is between Kamo river and Takase river. In the old days, it was an important place for the boats to carry the luggage and the people to transport. In 1712′, a tea stall (a roadside tea house where people could relax and have tea) was born around this area. It was made for the travelers who mainly used the boat to travel around this area in those days. In 1859′, Ponto-cho became an official licenced Hanamachi and became famous as a Geisha district in Kyoto. The district crest is the water plover; “Chidori” in Japanese. The Ponto-cho Kaburenjo Theater is right next to the river. And Ponto-cho is a narrowed straight street. People can feel the difference of the seasons and enjoy the night at this Hanamachi. Ponto-cho follows Ogami style of Japanese dancing. In spring, Kamogawa Odori (May 1st – May 24th), and in autumn, they hold Meisui Kai. Miyagawa-cho is the second biggest geisha district in Kyoto. There are 40 tea houses, and around 80 Geisha and Maiko belong to this association. Miyagawa-cho is located south west of Gion and east side of Kamo-gawa river between Shijo street and Gojo street. Miyagawa-cho has a very close connection with Kabuki. It is also physically close to the Kabuki Theater Minamiza, and has more than 260 years of history. Miyagawa-cho first began as a Shibai-chaya (tearoom is attached to a theater). Therefore, you can’t cut of the relationship with Kabuki. The district crest is three interconnected rings. This is symbolizing the unity of the temples and shrines, the tea houses, and the traditional townhouses. In some places in Miyagawa-cho, it has been declared as an area of natural history preservation. Miyagawa-cho used to follow Shinozuka style of Japanese dancing and Umemoto style of Japanese dancing, but now follows Wakayanagi style of Japanese dancing. Every year in April Miyagawa-cho holds a recital named Kyo Odori. In October they hold a recital named Mizue Kai. Not only the recitals, the beer gardens are held at Miyagawa-cho. People can enjoy having a conversation with the Maiko and Geisha, but the difference to Kamishichiken beer garden is that the people can enjoy the Maiko and Geisha performance while drinking and eating food. Gion Higashi is small Hanamachi and occupies the northeast corner of Gion. In the center of Gion Higashi, there is the rehearsal hall; Gion Kaikan. Gion Higashi used to follow Shinozuka style of Japanese dancing and Inoue style of Japanese dancing, but now following Fujima style of Japanese dancing. The area covers the east side of Gion; Hanamikoji street and Higashioji street, and north side of Shijo street. Right now, nine tea houses are continuing business. The nine tea houses are very near that people can easily visit by walking around Gion Higashi. As I wrote in Gion Kobu, the beginning of this Geisha district started as a tea stall in front of Yasaka shrine. After the days as a tea stall, it became one of the prosperous licensed Hanamachi in Kyoto. In 1881, Gion Geisha district divided into Gion Kobu and Gion Otsubo (Gion Higashi), and two Geisha district was born. In 1949′, Gion Otsubu had changed the name to Gion Higashi Shinchi, and started be recognized as Gion Higashi in 1955. Gion Higashi is also been declared as an area of natural history preservation. The district crest is same as Gion Kobu. The motif of the district crest is a dango, but eight dangos are connected in a circle. As you can see from the graph, there are lots of event to meet a Geisha. Such as “Miyako no Nigiwai (Five Geisha District Joint Recital)”, is also an event that you can’t miss. It is a chance once in a year to see the all star Geisha from the five Geisha districts. It is a very rare day to watch the Geisha cooperating the public performance. As you can see from the graph, there are lots of event to meet a Geisha. Don’t miss the chance to watch the event by your eyes. We are proud to offer an excellent opportunity for foreign visitors to Kyoto to meet and interact directly with Geisha, at an exceptional price, every Tuesday, Thursday, and Saturday from 6 pm to 8 pm. This tour includes dinner, an English guide, watching a traditional dance performance, and be able to play a unique game with the Geisha.